Actor Ajay Devgn, who turned 49 today, flew out of Mumbai for a vacation with wife Kajol, children Nysa and Yug. The family of four were spotted at the airport late on Sunday night. Ajay Devgn kept it casual in a black collar tee which he paired with grey jeans. Kajol wore a brown top, blue jeans and brown sunglasses. Their daughter Nysa, who studies in Singapore, made it on time for the family vacation. She was seen in a grey sweatshirt and a black tee and ripped black jeans. A sleepy Yug was perched in his mother's arms. Their holiday destination is not known yet. 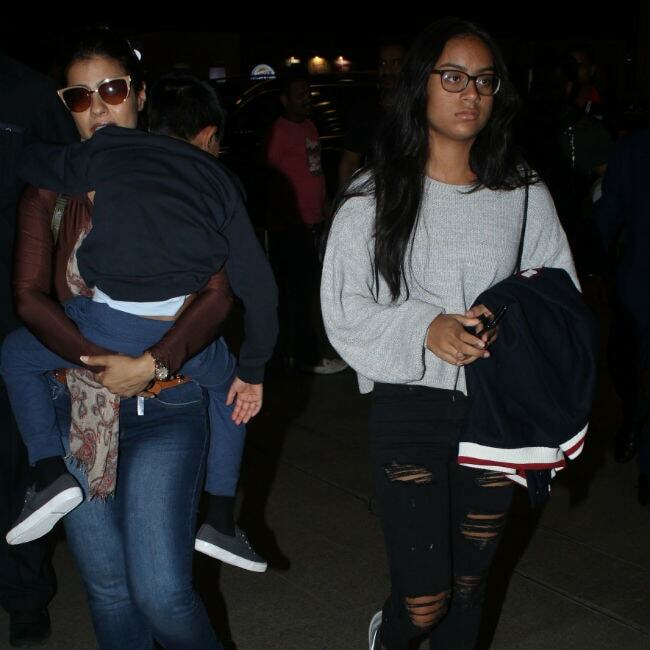 Take a look at Ajay Devgn, Kajol, Nysa and Yug's pictures at the airport. In an interview to Hindustan Times, Kajol had revealed that it was tougher for Ajay Devgn to send Nysa to Singapore for higher studies. "It was very, very tough for me, but not as tough as it was probably for Ajay because I have myself studied in a boarding school away from home," she had said. Ajay Devgn is a doting dad and we all know that. His Raid co-star Ileana D'Cruz said that he's 'obsessed with his kids.' (We aren't surprised). Ileana told news agency IANS, "He's a massive family man. He's obsessed with his kids, which is very lovely. He's really a positive person. When you are working with likeminded people then there are no pretences. So, it's nice working with him." Ajay Devgn, now 49, and Kajol, 43, have been married since 1999. They celebrated their 18th wedding anniversary in February. The duo have worked together in films like Hulchul, Pyaar To Hona Hi Tha, Raju Chacha and U Me Aur Hum, which released after their wedding. Ajay Devgn was last seen in Raid and he now has Total Dhamaal, Sons of Sardaar and a film with Tabu in the line-up. He is also producing Kajol's Eela.